Erik oversees our True Food Catering program, North Gate Cafe and food truck. He believes in excellent customer service and creativity for his clients while holding true to our districts high quality food standards. 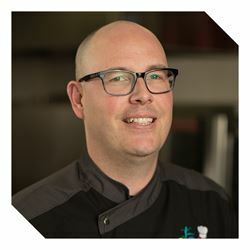 Erik has spent the last 14 years as a Food Service Director and Chef, most recent being at the Minnesota State Capitol Complex where he has executed countless catering functions. Erik is eager to share his experience with Minneapolis Public Schools.